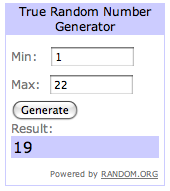 Commenter #19 is Tracy! She wins the vintage pattern giveaway for Simplicity 4920. Thanks to everyone who entered and spread the word for the contest. There's still time to participate in my yarn giveaway, going on through this Saturday! Enter now at the Fiber Fun, Giveaway post!